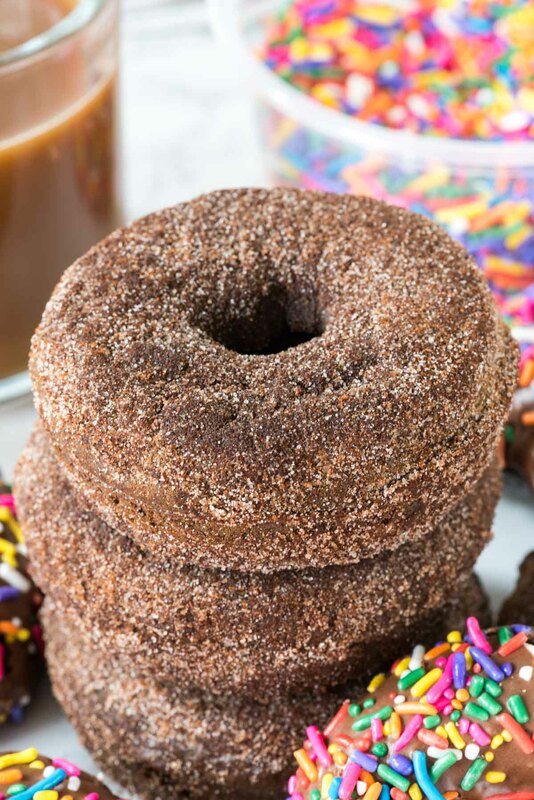 If you’re in the mood for an easy donut recipe, this one is for you: the perfect Baked Chocolate Donuts, two ways: chocolate glazed and cinnamon sugar churro! She also survived four math tutoring sessions, a dance rehearsal, two dance recitals, trips to Target and Walmart, and her dad being gone for a week. You guys, I’m exhausted. Somewhere along the line I missed the “summer is easy” memo. And, even with all that, I managed to make donuts for breakfast. I’m not a huge donut eater, but I could be. I absolutely love them and could eat a dozen Krispy Kremes in about 5 minutes. However, my waist would absolutely not approve of that so I stick to making donuts at home, and I bake them so they’re better for you. Plus, if they’re baked I can eat two! When I first started this blog, donuts were a HUGE thing. Everyone had donut pans and was posting recipe after recipe in all the flavors you could ever dream of. I even posted peanut butter donuts and mocha ones, and even ones with avocado. Then the donut craze passed by and my donut pan was pushed to the back of the cabinet. Last week I all of a sudden was totally craving a nice, cakey, baked chocolate donut. I dusted off the donut pan and got to work. The donut recipe itself is easy, one bowl, no mixer. Just stir it up with a wooden spoon and then pipe it into your donut pan. TIP: put your batter in a gallon size ziploc bag, then cut off one corner and pipe the batter into the pan. If you only have one pan, you’ll need to bake and cool the donuts a few minutes, then pop them out and refill the pan to finish the batch. Once they came out of the oven, I had to decide chocolate glazed or cinnamon sugar churro? That’s like Sophie’s Choice to me, so I made both. The chocolate glaze whisks up easily with just some powdered sugar, cocoa, and International Delight coffee creamer. I love using the creamer in the glaze because it adds some extra flavor. You can use your favorite, like Caramel Macchiato, French Vanilla, or Sweet Cream. I dipped the donuts in the glaze, and then sprinkled them with sprinkles. These would be so pretty with 4th of July colors, or even Christmas sprinkles! The cinnamon sugar churro topping is even easier than the glaze: simply dip the donuts in melted butter then roll in cinnamon sugar. 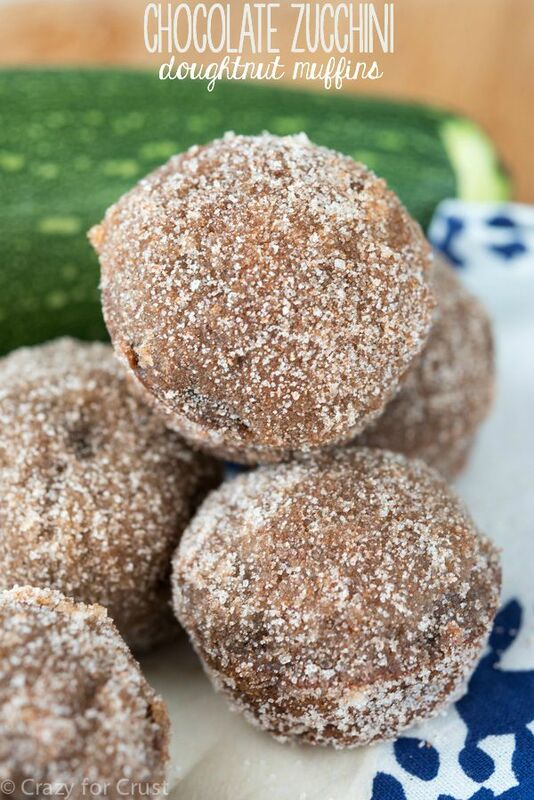 The spicy cinnamon pairs so well with the chocolate (like chocolate snickerdoodles) and I love the crunch the sugar gives the donut. The cinnamon sugar ones were my favorite (and Jordan’s too). This really is the best chocolate donut recipe I’ve had, and I’ve tried a lot of them, believe me. In my donut heyday I was making them weekly! Which topping would you like best? 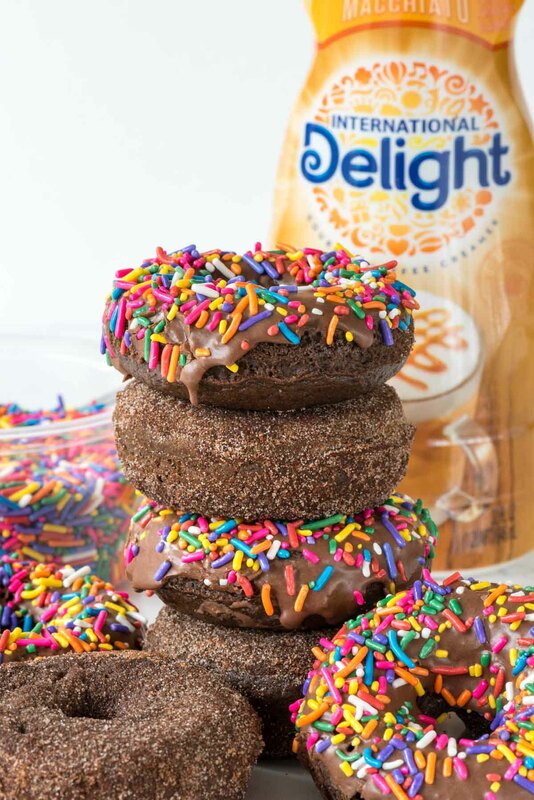 These are the PERFECT Baked Chocolate Donuts! 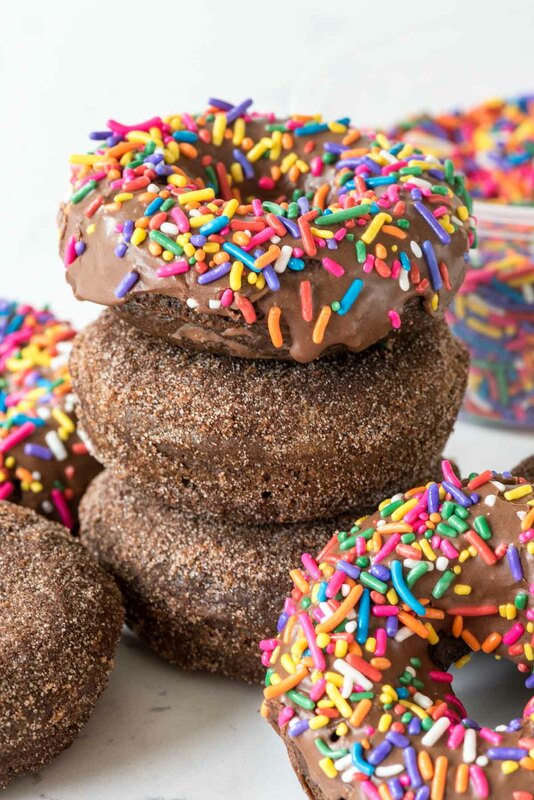 This recipe gives light and fluffy donuts two ways: chocolate glazed or cinnamon sugar churro! Preheat oven to 350°F. Spray donut pan(s) with nonstick cooking spray. Whisk flour, cocoa, soda, salt, and sugar in a medium bowl. Set aside. Whisk the creamer or milk, egg, oil, and vanilla in a measuring cup. Whisk into dry ingredients. Transfer the batter to a large gallon size resealable bag. Cut off one tip and pipe into donut pan(s). Recipe makes 8-9 donuts. If you only have one donut pan, fill and bake 6, let them cool 10 minutes, then remove them from the pan, respray the pan with nonstick cooking spray and fill with the rest of the batter. You can also make these as mini muffins. Baking time will be affected. Bake for 7-8 minutes until a toothpick just comes out clean. Let cool in pans for about 10 minutes, then carefully remove and top with glaze or churro topping. 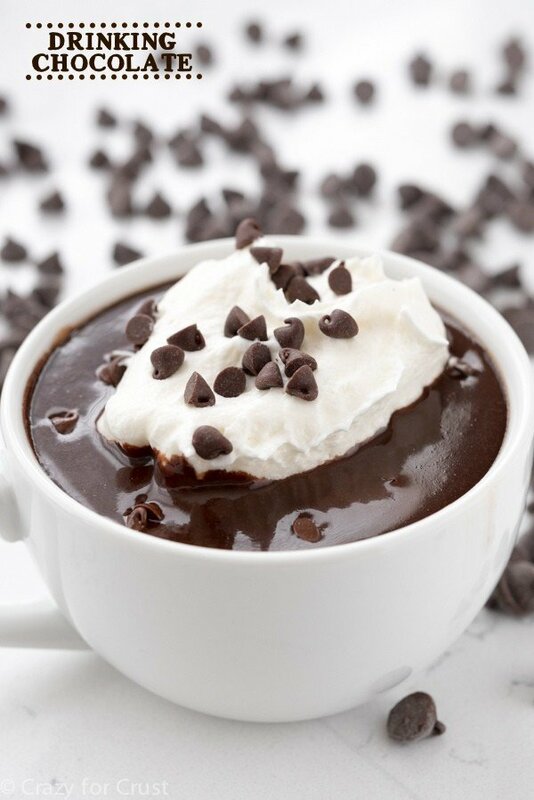 Glaze: whisk powdered sugar and cocoa, then whisk in coffee creamer slowly. Dip the cooled donuts upside down in the glaze and place them on a cookie sheet or flat surface, glaze side up. Sprinkle with sprinkles. Let sit for about 20 minutes for the glaze to set. Churro topping: Whisk sugar and cinnamon in medium bowl. 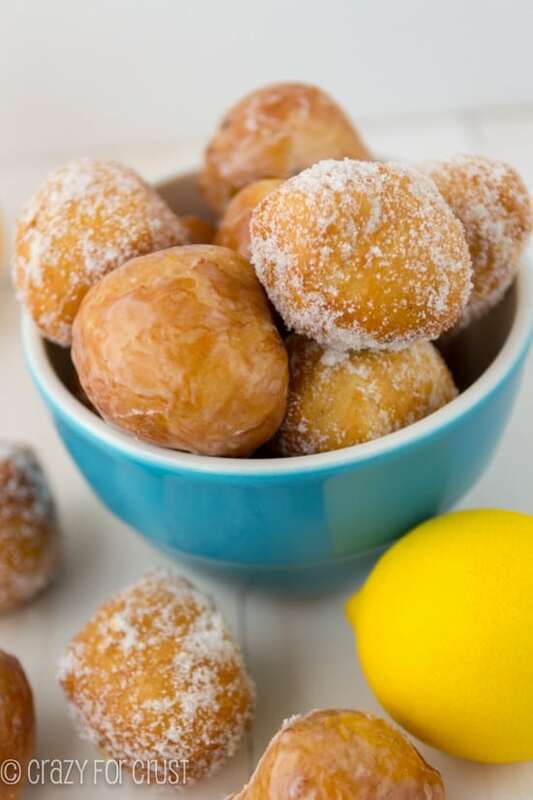 Dip donuts in melted butter, then dredge in cinnamon sugar. Once you’re done with all of them, give them a second dusting in the cinnamon sugar. Best eaten the day they’re made, but they’ll last up to 2 days in an airtight container. Sign up for the International Delight Newsletter or find them on Facebook, Pinterest, Instagram, or Twitter. You are totally the best mom ever. Does Jordan go to camp at any point? I’ve been a bad mom and let my kids leave me so I can get stuff done. But you’re giving her amazing memories, and believe me, Hawaii sound pretty dang fantastic right now. Also fantastic? These. They’re GORGEOUS. I want about five for breakfast! Yup, I’m pretty sure you win the award. You’d win it alone based on these fabulous looking donuts! These are gorgeous and I love your collage! The sprinkles just POP! You totally get that award. What a busy summer so far! I have fond memories of churros from WAY back in junior high, so I pretty much want five of those donuts right now. They look great! Wow, Jordan’s summer list is making ME tired haha! You definitely win mom of the summer award for sure! And these donuts look perfect! I wish I had one (or five) for breakfast! Just when I thought I was going to be able to survive today without a donut. But hey, I can’t even be mad when they look this good! And they’re baked, so it’s totally okay, right!? Right. Ha! Love these! dude…you’re seriously THE BEST mom. WOW. and these donuts obviously just put you over the top into like the realm where no one could ever even tough your greatness. I wish I had a couple of those cinnamon sugar churro donuts to go with my coffee right now!